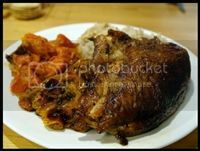 Really tasty moist chicken! I like how you get a lot of flavor for not much effort. The first time, I just made the original recipe. The next time I made this, I tried doubling the spices as suggested by some of the comments and really liked that. The doubled spices formed a flavorful crust on the chicken (though the spices blackened considerably). To make this an even faster prep, you could mix up the measured spices and keep those in baggies. Then add oil and cook whenever it's time. You could even rub the spice mix onto the chicken the night before and then just pull the prepared chicken out of the fridge when you're ready to cook if you're in a hurry when dinner times roll around. I think it makes an easy weeknight meal. For sides, I've liked stir-fried green beans, roasted butternut squash, roasted potatoes, and rice. Give this one a try! One of my friends had stumbled across my list of Boston Museums for Free when he first moved to Boston and hadn't realized it was mine. I was so pleased to think anyone actually read my post that I'm finally getting around to posting about NYC museums. Just a 4.5-hour bus ride away, NYC is one of my favorite places to visit. Here's a list of ways to get into various NYC attractions for free. If you know of other ways and places to get in free, let me know and I'll add it to the list! It's cheap lobster season here in New England again. Market Basket had lobster on sale for $4/pound and they'll even steam them for you if you're squeamish about doing that part yourself. Some will say you shouldn't buy lobster in the summer (I think the rule is to not buy lobster during months that don't end in 'y'). (Correction: the rule was to only eat shellfish during months ending in 'r') These are 'New Shell' lobsters so they haven't had a chance to grow into their new shells. Their shells are very soft at this point. Those lobster crackers won't be of much use with soft shell lobsters. Better to use a sturdy pair of kitchen shears to get at the meat inside. Picked up 6 lobsters for $17. That's less than the price of a single lobster roll at Neptune Oyster (oh but what a delicious lobster roll they serve! Piled high with tons of lobster meat too). So far we've eaten steamed lobsters and Lobster Mac-n-cheese. 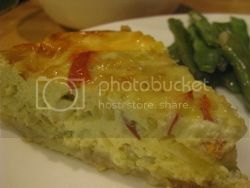 I'll probably make the lobster quiche again unless I can think of something else to make with the remaining 2 lobsters. I realized tonight that my camera's memory card had mysteriously wiped out a lot of photos on it from my NYC trip. I opened it up on my computer and the photos from Italy back in January were on it but not the photos from last week in NYC. I popped it back into my camera and couldn't see them there either even though I know I had seen them on there just a few days ago. I berated myself for not immediately downloading and backing up the photos. I mentally reviewed the trip, trying to remember exactly which photos I no longer had. And then I turned to the web, looking for programs to help me find my files again. I tried the first 2 programs listed and the first one didn't find very many but it did find a handful so I had some hope that files were still there. Tried the next one (Puran) and hit the jackpot. I don't know if it recovered all the files but it recovered a whole lot. Enough to make me feel a lot better. Doing the Deep Scan takes a long time but it was able to find 1000 jpgs that I thought I had lost so well worth the time. Free program too! Saturday afternoon, I found myself sitting in a line of folding chairs, sandwiched between 3 little girls on one side and 2 little sisters on my other side. At the other end of the line sat a couple, smiling nervously at each other and quietly taking in the scene around them. We were sitting inside the mini amusement park inside Jordan's Furniture in Reading, MA, waiting for our trapeze class to start. The kids were mostly staring at the water show as streams of water swayed in time to the blaring music. I was staring at the rigging trying to assess how safe it looked. My first thought was that the safety nets down below looked really dinky. There were 2 pairs of swinging trapezes at the top. Below each pair was a narrow strip of netting. There was a partial GAP between the nets. The whole thing was supported by lots of cables and when you climbed up to the top, you realized that the platform sways around. Once when my sister was visiting from out of town, B and I took her there to try out their trapeze with some trial swings. It was terrifying but kinda fun too. Afterwards we stuck around and watched others swinging back and forth and I thought I'd like to try again some day. Some day came over six years later. My friend had bought a class but her shoulder was injured and it was too late to cancel so I got to take her place. Then a verbal walk-through of what we're going to do. 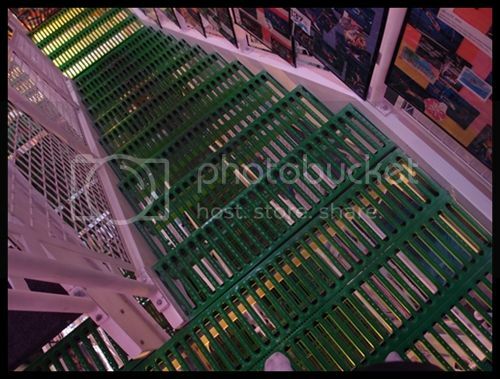 Walk up the stairs to the platform and they'll clip two safety lines to the belt cinched tightly around your waist. Every time they say, "Ready," then we're supposed to get ready to do something in the next moment. In this case, ready means to bend your knees and HUP means hop off the platform. It doesn't have to be a big jump. After all, we're just dropping into air. We all stand up, toes right up to a line on the floor. We reach out and grab and imaginary bar. One by one, he goes down the line saying, "Ready...HUP!" and we hop over the line. Simple enough. We sit back down for more talking. Once we're hanging from the bar, they'll call out instructions and we'll hang from our knees and then go back to hanging from our arms before dropping into the net. "So...any questions?" And the kids had plenty. "What if I can't get my knees up over the bar?" "What if I fall off the platform?" "What if I can't hold onto the bar?" "What if I fall off while I'm hanging from my knees?" What if I'm too scared to jump off?" Basically every question I had but was too self-conscious to ask myself. They they started sending us up to the top, one at a time. 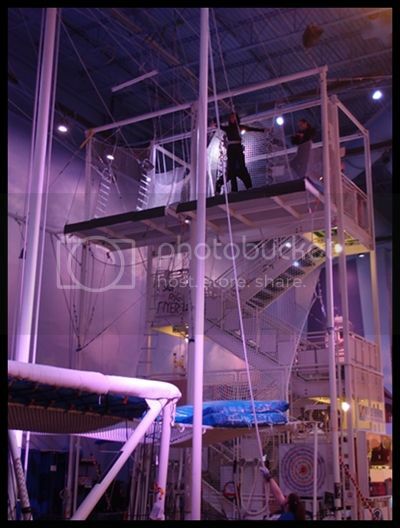 I was surprised that we were not trying things out on the low trapeze bar in the back. Instead it was right on up to the top. We walked up about 2 flights of stairs. The steps are slotted and my feet hurt a little walking on them. I wonder if the slots are put there intentionally to sharpen the awareness of how high you're going. If so, it's working. I'm feeling nervous. When I get to the top, she clips the safety lines to my belt, one on each side. She tells me to rub some chalk on my hands if I need to. I'm about to decline until I realize my hands are indeed lightly sweating. I don't think I NEED the chalk but I rub some on just in case. If you're in the Boston area and you'd like to see one of their free performances, they have one this Saturday night 7:30pm-8:30pm at Jordan's Furniture (the one in Reading, not Natick). 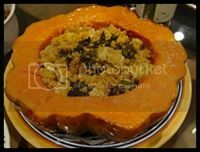 The active prep time is a bit longer if you're starting with just the butternut squash and need to peel and cube it yourself. (Or at least, it takes me longer.) To prep the butternut squash yourself, use a big knife to cut off the top and bottom of the squash. Now slice it lengthwise in half. Scoop out the seeds and save those for later to make Fried Squash Seeds. Use a vegetable peeler to peel off the skin. Then cut it up into half-inch-sized cubes. The last couple times I've made this, I've prepped the vegetables on the weekend (roasted the butternut squash, torn up the kale) and then assembled and heated it up on the stove top for a quick meal during the week. Don't cook the kale ahead of time since it loses a bit of its brightness upon reheating. If I'm doing it all at once, I'll get the butternut squash into the oven first, and then while that's roasting, I'll prep the kale and chop nuts. Seems to hold up well to substitutions too. My sister doesn't like onions so we left out the shallots. Later when I made it, I substituted in onion since I didn't have any shallots. 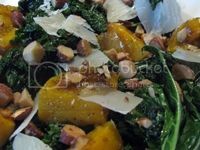 We used other squashes instead of butternut squash, different hard cheeses like pecorino and manchego instead of parmesan, and substituted various roasted seasoned nuts for the almonds. The most amazing nut we've used was garlic-seasoned macadamia nuts. All times, it's been scarfed down pretty happily. My boyfriend is generally indifferent to kale (except for kale chips) and butternut squash but he gobbled this up contentedly. Hope you like this too! Click to see Recipe and Bigger Photo. While lobster was so cheap in August (just $4/pound at the grocery store in the Boston/NH Seacoast region), we binged on lobster dishes for a week. Steamed lobsters with melted butter, lobster quiche, and today's dish. 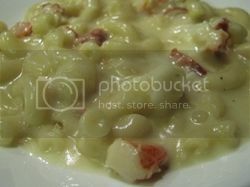 Inspired by hearing canyoncat mentioning he cooked up lobster mac-n-cheese a few years ago, I've been curious to try making that dish ever since. Yummy! Definitely hanging on to this recipe to make again some day. When I served this up, there were lots of contented mmmmms at the table. I felt lucky to be enjoying that meal together with both friends and family. This summer, a friend invited me to her family's vacation home in Maine and made lunch reservations at Jordan Pond House in Acadia National Park. The traditional thing to do there is have tea and popovers. But the highlight of the meal for me was a piece of lobster quiche. It was a small piece of quiche but it was so yummy that I immediately looked for recipes when I got home. Since lobster was on sale for $3.99/pound, it was even an affordable indulgence. Besides, making this at home gave me an entire quiche for the price of a single serving when eating out. I highly recommend giving this recipe a shot. The sweet lobster flavor comes through in every bite. Liked it so much we made it again when we had some friends over for dinner. The project has spread to cities around the world and been translated into several languages. You can go to the project's website to buy a kit that helps you make your own wall. If you don't want to buy the kit, she's also given instructions on how to make your own kit. I love this project. 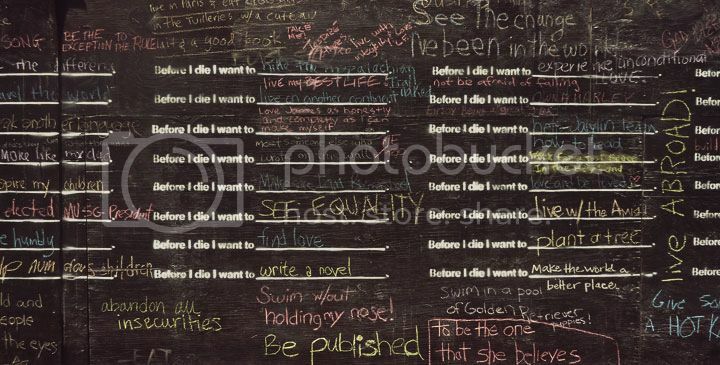 I love the photos of people standing in small clusters around the wall, reading what others have written, chatting with others. I love that her interactive art project coaxes people into interacting with each other as well as with the wall. So....your turn to finish the prompt.